There is more to the Wild Wild West than cowboys and Indians! The residents at Mesa mobile home parks know that Arizona is home to some fascinating wildlife. Here are a few of Arizona’s most famous native animals and a few tips on how to behave around them should you ever encounter one. Gila monsters are venomous lizards known throughout the Southwest for their bite. The bite of a Gila monster is extremely painful, but definitely not fatal. Gila monsters are generally very calm animals as they have few predators in the wild. However, younger Gilas as can be dangerous as they are less docile and more defensive. If you encounter Gila monsters, don’t panic, but don’t do anything that might provoke them. Though they are usually calm, they do have protective instincts so don’t give them a reason to bite you! Bobcats are shy, solitary felines that are larger than the average housecat but much smaller than a mountain lion. They pose little threat to humans, but they have been known to prey on pets. If you are concerned about the safety of your animals, be sure to never leave them unattended outdoors. Keep your dogs on leashes when you walk them and do not allow your cats to wander outdoors. Make sure all your pets are vaccinated against diseases that wild felines like bobcats might carry. Rattlesnakes are the venomous predators of rodents such as mice, rats, and small birds. Even though humans are not typical rattlesnake prey, rattlesnake bites can be fatal to humans if treated improperly. To stay safe, make sure you are able to recognize a rattlesnakes tell-tale signs when it is about to bite. For example, if the snake is in a coiled position with its head raised, it feels threatened. If it shakes its rattle, it is about to bite. Steer clear of rattlesnakes, and if you are bitten remain calm and get to a hospital. Elk are typically found in northern Arizona, so be on the lookout if you head up to Flagstaff! Male elk are known for their telltale antlers that shed annually. Though they may look intimidating, elk diet solely on grass, plants, and bark, so humans have no reason to fear. Elk hunting in Arizona is popular, but if you want to partake make sure you have a permit. 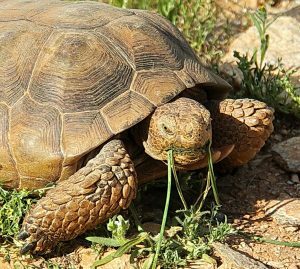 Desert tortoises are found all around the Mojave and Sonoran Deserts and diet mostly on leaves, wildflowers, and cacti. They pose no physical danger, but finding one in your backyard may be a little galling! If you find a desert tortoise on your property near Mesa mobile homes, it is likely escaped from captivity. Before it goes and eats the plant life in your backyard, bring it to an adoption facility. Or, if you are interested in keeping the tortoise, you can legally adopt it from the state of Arizona!